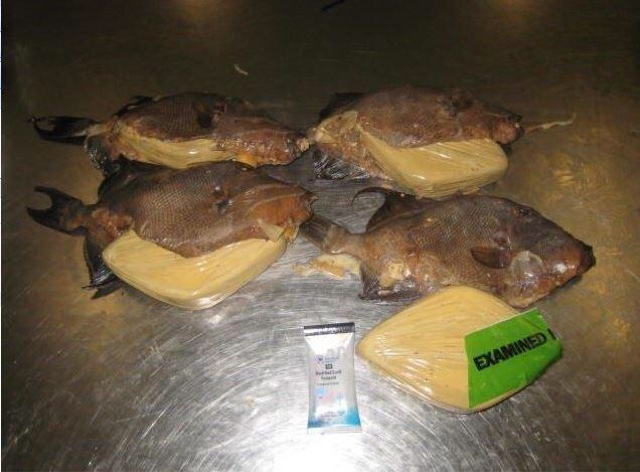 According to U.S. Customs and Border Protection officers at Miami International Airport, a 38 year old 'would be' drug smuggler concealed more than two pounds of cocaine in some fried fish. The woman arrived from Jamaica Saturday morning and was carrying the fried fish with her luggage. I'm guessing that the officers smelled something fishy from the get go. Upon X-ray examination of the fish, anomalies were noticed in some of the cooked fish. Officers said "the bellies of some of the fish were sewn together and certain fish felt thicker than the rest". That's when they found 2.3 pounds of cocaine hidden inside the fish. The woman has been arrested and her name has not been released.